Everyone knows man’s best friend is his printer, but dogs come a close second. So why don’t dog vs. printer videos get the same amount of online love as cat vs. printer videos. We dig deep for doggy answers…and surplus, unused toner. Cat vs. printer videos are far more popular online than dog vs. printer videos. Why? Puppies are just as cute as kittens, no? Yes, but dogs bark when they’re excited, which automatically makes these videos loud and generally not safe for work. And if you play these dog videos at full volume at home, your own dogs will likely freak out. 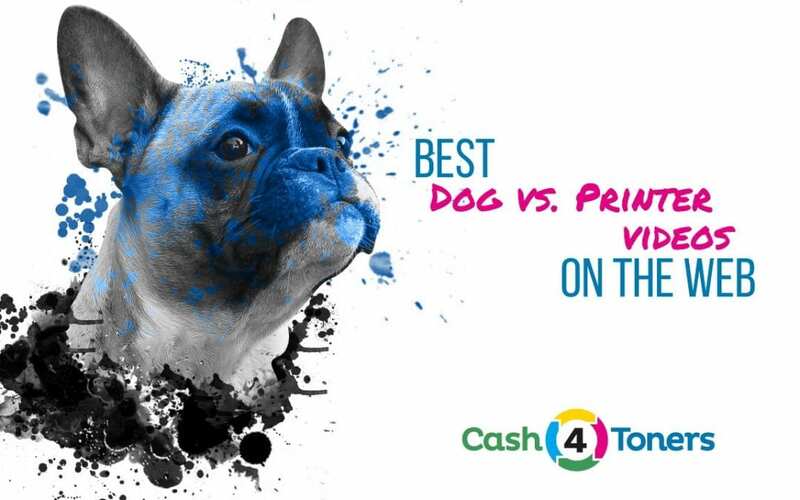 Dog vs. printer videos are a blast, but you need to watch them at the right time, in the right place. That time and place is here and now. 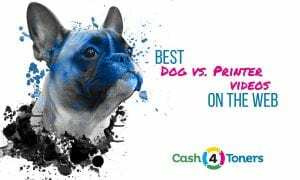 Here are our favorite dog vs. printer videos. This little fluffy white Maltese doesn’t understand the finer points of printer operation, especially two-sided printing. It studies this machine from every adorable angle, but can’t seem to figure it out. Toner is strange, little doggie! You can’t fool this tiny brown Dachshund. It knows the printer is an evil alien thing that must be destroyed. If only its owners would get hip. Popeye is adorable and has survived some trauma — his back legs are missing. But Popeye seems pretty well adjusted … except when they add paper to the printer. Then he turns into a snarling hellhound! Popeye must hate having excess, unused toner lying around! A 10-month-old black lab fights with an HP inkjet. He’s probably confused…what is this printer doing up on the bed? There’s not much of a fight here. Just adorable cocked puppy head and curious barks. Nick from the Computer Cube Channel is babysitting Grandma’s Pomeranian, and little Brady is perplexed by Nick’s Brother laser printer. The dog seems equally confused and distressed by Nick’s old sneaker. Sandy is a gorgeous Shepherd mix who is all perky ears and alert posture once the printer starts cranking. Sandy sits patiently, studying the machine, but doesn’t seem any closer to figuring out its secrets. Don’t worry, Sandy. Printers confuse us too. Two cocker spaniels bark and howl at a whirling DTG large-format printer, circling the machine like they’re afraid it will run away. A memorable celebration of International Bring Your Dog To Work Day. Mark your calendar for Sell Us Your Unused Toner Day…it’s today! Walter the French Bulldog meets the printer for the first time and is not at all impressed. Why is this thing so noisy, and why does it spit paper? Walter the French Bulldog wants to neuter this printer. Indy, a mid-sized brown mutt, whines and cries whenever the HP prints a page, going so far as to snap at the page as it ejects from the printer. We feel the same way sometimes, Indy, especially when faced with excess HP toner! An adorable dalmatian gets excited by a potential predator. This printer has lurked around the house a while now, making noises and acting unpredictable. It’s time for this doggie to take matters into its own paws…and jaws! Drewsta33 has a feisty chihuahua who takes no nonsense from this Epson, viciously tearing the printout to shreds as it emerges from the printer. In the battle of dog vs. printer, this powerful Chi is the clear winner. This big, graceful Golden retriever mix examines the printer, trying to learn its secrets. But the mysteries appear to elude him, as he opts for a lengthy examination before returning to his nap. This beautiful and diligent Jack Russell Terrier is seriously upset by this Epson Workforce, barking, scratching and clawing at the table holding the printer, not letting up until the printer quiets down again. Good boy! Not quite an attack…just a few warning barks and extreme puppy cuteness. A-dor-a-ble! This cute chihuahua gives an inkjet the hairy eyeball before tearing into the printout as it emerges from the machine. Chihuahuas don’t tolerate fools! Smart chi-chis know what to do with surplus HP toner! Loveable mixed-breed furball barks exactly three-and-a-half times at a 3D printer before losing interest and wandering away. He’s not scared! He’s bored! Listen, Teach, the dog really did eat Sean’s homework. Just watch this video if you don’t believe us. The kid’s assignment doesn’t make it out of the printer alive! This cute little mixed-breed is named Oliver, and he’s pretty sure he hates the printer. It appears he’s never seen one in action before, but you get the impression the next time he sees one he will not hesitate to attack. Cute-as-pie puppy Billy shows this Canon Bubblejet who’s boss. The super-cute mixed breed puppy barks at the printer until it shuts up. Good job, Billy! Don’t ever bet against the wiener dog.They’ll make you look silly. Just look how this passionate wiener goes to town on this printer. Winner, winner, wiener dinner! This Yorkshire terrier doesn’t like this print job, so he barks, shrill and jarring, while his owner cackles and films the awkward interaction.Cut the nonsense, people! Your printer hides an ugly truth! This black-and-white mutt hates this printer passionately, barking and whining as the page spools, not stopping until it’s done. Clearly, this printer must die.His buddy joins in for the final attack. A cute white dog barks passionately at the printer lying in the middle of the living room floor. The dog is particularly perturbed by the way the paper gets sucked into the printer. Best part is the black dog who wanders in at the end to see what all the fuss is about. You can tell Lucky is a smart dog. His ears are up and he’s on high alert as he watches this multi-function printer spit out a page of text. Lucky will figure it out. His owners…maybe not. Bella is a beautiful Border Collie who seems perplexed by the printer, yet eager to retrieve the printouts it ejects. Bella is probably great at fetching slippers and newspapers! Daisy is a tea-cup Yorkie with the heart of a lion. She bravely barks down the printer even though it’s five times her size, and when it ejects a printout, Daisy wastes no time tearing it to shreds. Good girl, Daisy! Sell us your surplus toner! This black Lab appears to be napping in the middle of a messy room, when the printer suddenly springs to life. The Lab quickly grabs the printout and chews it, no doubt annoyed that more scrap paper has been added to this already crowded space. An adorable Yorkie-poo patiently watches a real estate listing being printed by an inkjet, and then gently removes the page from the printout tray. Good dog! See if your owners have any leftover, unused toner cartridges they want to sell us.